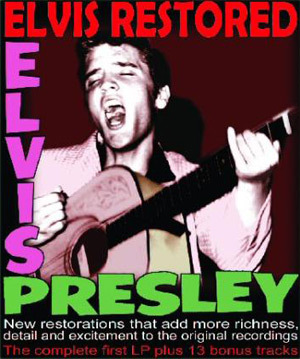 The release "Elvis Restored" is a re-issue of Elvis' debut album on the Avid label. This CD, due out November 3, 2008, contains the original album plus 13 bonus tracks. According to the cover "New restoration that add more richness, detail and excitement to the original recordings". Josh&Jody, I agree that some FTD releases directed towards the last few years of the 1960s would be great, and would possibly help restore some fans faith in the label, given the number of negative comments coming through on this site about recent releases. A double "Elvis '69 - The American Studios Sessions" set would be a great start, followed by "Studio B - Nashville '67-'68", featuring the September '67 (i.e. "Guitar Man", etc.) and January '68 (i.e. "Too Much Monkey Business" and "U.S. Male") sessions. I would omit "Goin' Home" and "Stay Away" from this last release, but would include them in a third CD, "Change Of Habit: The Movie Years '67-'69" featuring the best songs recorded for Elvis' final 5 scripted films. Released and out-take versions of songs such as "All I Needed Was The Rain", "Goin' Home", "Stay Away", "Wonderful World", "Edge Of Reality", "A Little Less Conversation", "Almost In Love", "Let's Forget About The Stars", "Charro! ", "Clean Up Your Own Backyard", "Swing Down Sweet Chariot", "Almost", "Change Of Habit", "Let's Be Friends", and "Let Us Pray" would make a great compilation and may help address the issue of how best to release them to the market, given that only a handful of tracks were recorded for each of these movies. As someone who has a particular fondness for the film "Live A Little, Love A Little", I would also love to see some of Billy Strange's wonderful score from the movie included as a couple of bonus tracks on this last CD (what's an Elvis soundtrack release without bonus tracks? ), as this would give fans an extra incentive to buy this album. However, as M-G-M and not the RCA label would hold the rights to these recordings (and who knows where the master recordings are anyway), this idea may be prohibitive. As Elvis fans, we are fortunate to have been given access to so many rare and previously unreleased songs and outtakes through the FTD label, box sets, etc (As far as I'm aware, fans of The Beatles by comparison have only had the 2 "Past Masters" and 3 "Anthology" sets to choose from). Let's hope that we continue to see some great releases in the future, as albums such as "Elvis Restored" hold little attraction to most, except the most avid (no pun intended) of fans! Sounds aweful...another WalMart release or fit to be aired in all Starbucks Cafes ? Now if they are going that route, it might be very interesting for that label or BMG’s FTD label to release a RESTORED Elvis at the AMERICAN STUDIOS carrying two CDs with all outtakes (fab unreleased staff available only today on bootlegs) of those famous Jan and feb 1969 sessions (incl. slow version Stranger i/home Town) With the same idea we'd love to see this label or BMG release on FTD the MISSING 67 (GuitarMan) and 68 (Monkey Buzz, USMale) studio sessions and outtakes plus bonus songs from the HGTArt session (+those great outtakes of Down i/Alley etc) Now that's another "winner" for all. Y'all agree? Please let us know. Elvis Restored....sounds weird, in relation to the artists passing some 30+ years ago. Jerome if this release adds more riches to your bank acct. then you must own the company that produces it. Buying it would help delete my bank acct. so I will pass on this somewhat dubious release. new restorations to add more richness to my bank account..
How much more detail & richness can be added to 50 year old recordings that contained 4 instruments? Enough of this BS. Unless you were in the room with them when they recorded these songs, I think we have the best sound possible already. And i suppose in a few years another release will come out with better sound quality than this!! No,i suggest ordering it now! Can I go on living without it?